Teragren Bamboo Flooring is the Natural Green Flooring. Bamboo, unlike other raw materials used to make flooring, is a grass. To manufacturer this "green" flooring, Teragren Bamboo cuts the bamboo grass stalks into small slats, which are then laminated together using an adhesive and hydraulic pressure. Caramelized Bamboo Flooring is an alternative to Natural Bamboo --- offering a coffee-colored appearance without the use of dye or stain. The Caramelized Bamboo color is produced naturally by pressure heating the Bamboo slats. Teragren Bamboo Flooring is manufactured with an Aluminum Oxide/Polyurethane Finish, and comes with a 25 year structural warranty. To learn more about how bamboo flooring is an environmentally "green" choice for your flooring needs, visit our article here: "Why Bamboo is an Environmentally Friendly Flooring Choice"
Teragren's click locking styles are also very easy to install just drop and lock the boards together. See their Installation Instructions. 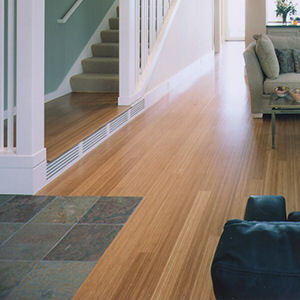 Teragren Bamboo Flooring offers several unique collections, offering homeowners a variety of options when it comes to choosing Bamboo Flooring. Traditional Bamboo Flooring can be found in the Teragren Bamboo Flooring "Signature" collection. Also offered is a Floating Bamboo Floor in the Studio Collection, wider planks in the Teragren Craftsman Collection, and a unique fused series of bamboo stained products in the Synergy collections.